Wales 20 fish 190 place points 18520 total points. Team Scotland would like to thank all team supporters and sponsors, New Haylie Fishery, Reelsport, Flybox, Bloke rods, AB Upholstery, all who attended fund raisers at New Haylie and Kingennie and everyone who donated prizes and gifts. Allandale Tarn, Polbeth were hosts for the 2015 final. Results are here. On a blustery cool day small flies, buzzers and dry flies proved to be most successful. 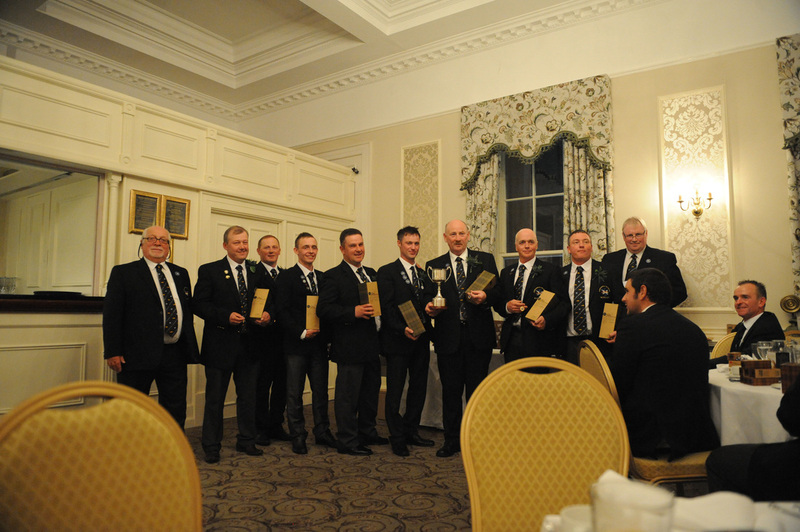 In a strong line up Mike Cordiner from Aberdeen emerged as individual Champion. 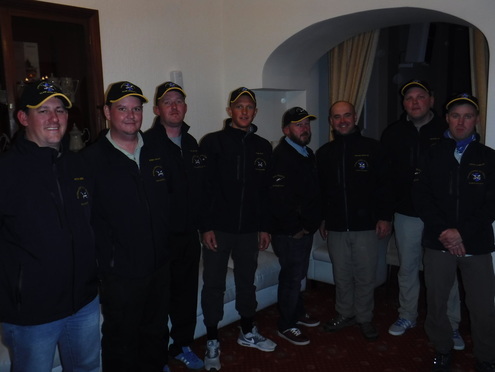 The top 6 anglers and travelling reserve were selected to represent Scotland at the 2015 Bank International at Woodford Fishery, Carrickfergus on 14th October. Mike was fishing 4lb nylon and small black CDCs. SANA would like to thank our hosts Allandale Tarn who have supported this event from the earliest days and to all the marshals who turned up to assist. 136 fish were caught average 6 per rod. Fish were caught all round the fishery and this was an excellent return for the 22 anglers. The 2015 National Bank Competition heats, semi final and Final dates are available here. We are delighted to confirm our hosts for the final this year will be Allandale Tarn, Polbeth, West Lothian. Thanks to all the fisheries who have agreed to give their water over for one of our events. There will be 6 heats. This year anglers will pay a one off entry fee which will allow them to compete at multiple heats to gain a place at our semi finals. There will be 24 anglers at the final and 24 anglers at each semi final. The top 6 anglers and 1 named reserve will travel to Ireland in 2015. All Competitors are responsible for reading the National Rules which can be found here. Any local rules will be announced at briefing at each venue. To reserve your place at any heat please contact the fishery. Contact details are here. 5th Bank International held at Chatton Fishery, Northumberland held on Wednesday 29th October 2014. Teams had been practising since the weekend at the superb Chatton fishery. Using Dunnydeer and Ross Lakes the fishing was very consistent and challenging. 120 fish were caught in total on competition day, rod average 5 fish per rod. Weather had been blustery during practice and the fishing challenging, until competition day and the wind dropped temperatures rose and the teams targeted rising fish. After the morning session Ireland had a narrow lead over England with Scotland and Wales a little distance behind. A consistent team effort saw Ireland maintain their lead to secure the 'Founding Nations Cup' for the first time. Team Ireland Campbell Baird (Captain) Brian Kerr, Harry McAteer ,Joe Quinn, Conor Cunningham, Hubert Smith and Manager Darren Wallace. 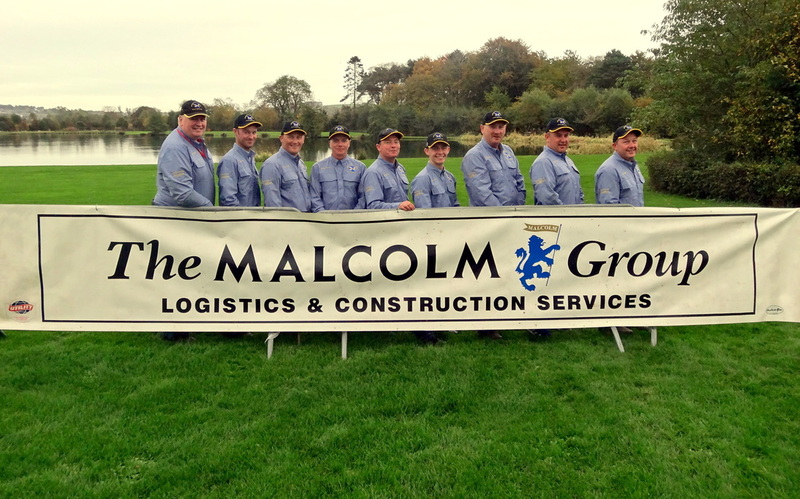 Team Scotland were represented by Stuart McCormick Manager, Alan Hill, Steve Corsar, Grant Osler, Chris McAllister, Ian Skilling, Stephen Cowan and John Brown. 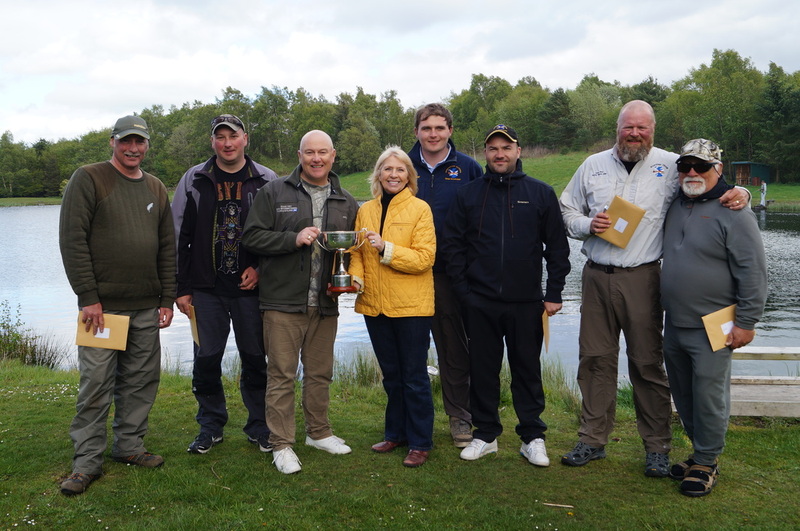 The first ever 5 Nations Fly Fishing Competition proved a great success as part of the Stirling International Angling Festival. The Competition attracted multiple teams from France, Ireland, England, Scotland and one team with competitors from both Belgium and Luxembourg. 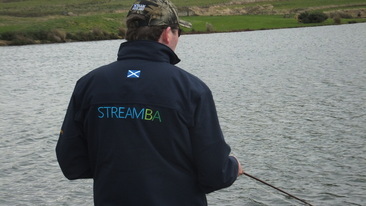 The event was fished at four venues - the River Carron, the River Devon, Carron Valley Fishery and the Lake of Menteith. Team England B took Gold with Team England A taking Silver and Team Scotland A collecting a very creditable bronze. The medal team results can be seen here. The Individual Gold was won by Robert Brown - England A, with Silver going to Kenny Riddell - Scotland A, and Bronze to Paul Lee - England B. The full individual results can be seen here. 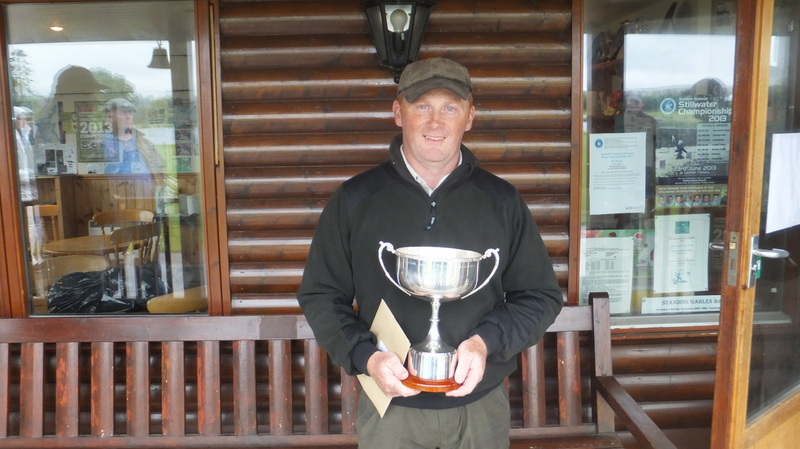 Alan Hill from Troon is the 2014 Scottish National Bank Champion. In testing windy conditions in the morning, hail storms in early afternoon easing off to good conditions Alan caught and released 17 fish to earn 27 points to secure the title. 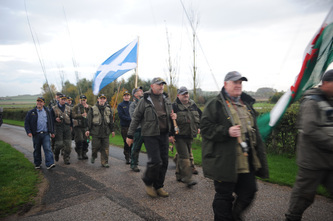 24 anglers competed at New Haylie Fishery, Largs and were treated to some great fishing. With a rod average of 7.8 fish a total of 173 fish were returned. SANA would like to thanks our host George Murray for allowing us to use the fishery, for his generosity in supporting the event and to his wife Senga and Eileen Quinn for their hospitality and catering. 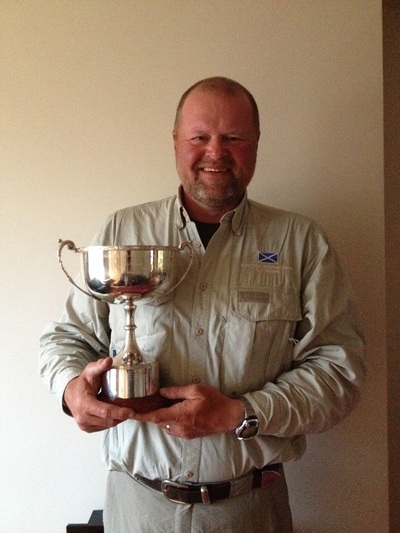 Pictured below is Alan with his trophy and the Team selected for the upcoming Bank International in October at Chatton Fishery, Northumberland. The Team selected in order is Alan Hill, Grant Osler, Steve Cowan, Steve Corsar, Iain Skilling, Chris McCallister and Alec Bowler. The results of the National Bank Championships Semi Finals 2014 can be found here for Allandale Tarn and here for Kingennie Fishery. SANA would like to thank both these venues for hosting our semi finals. 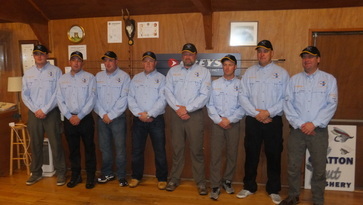 The final is on Sunday 24th May at New Haylie Fishery, Largs, the full list of finalists is here. Top 6 anglers and 1 named reserve will form the Scotland Team to compete in the Bank International on 29th Ocotber 2014 at Chatton Fishery, England. Report: Scotland held off a strong challenge from England to claim victory in the 4th Bank International. Scotland secured Team Gold, Top Individual and Longest fish, a clean sweep of all the prizes. good during practice and apart from the last hour it remained similar during competition day. Teams of six representing each nation. After the morning session Scotland had a narrow lead over England with Wales and Ireland a little distance behind. A consistent team effort saw Scotland maintain their lead to secure the ‘Founding Nations Cup’. Lochter proved to be excellent hosts with superb facilities complimenting the close competition. Full results are available here, morning and afternoon sessions and final placings. Team Scotland: Kenny Riddell (Captain) Steve Corsar, Stuart Crocket, Alan Gilbert, David Bullen, Andy Dunn , Bobby Quinn(Reserve) and Manager Alec Bowler. Scoring: . 2 sessions Morning and afternoon. Placings from each session determine Team and Individual winners. 100 points per fish then 20 points per centimetre. Total catch and release. Alan Gilbert, pictured, a Police Officer from Glasgow is the new Scottish Stillwater Champion. 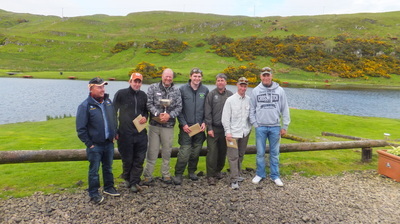 On Sunday 23rd June 44 anglers competed at Lochter Fishery, Old Meldrum, Aberdeenshire. Alan caught fish early on and during the inclement weather. Conditions and fishing were difficult with many fish showing but declining everything offered to them a lot of the time. Top positions and Team selection for the Bank International at Lochter in October 2013 were keenly fought and final placings for team selection came down to timing of first fish caught. 105 fish were caught and returned, 2 points awarded for each first fish per peg, then 1 point thereafter.